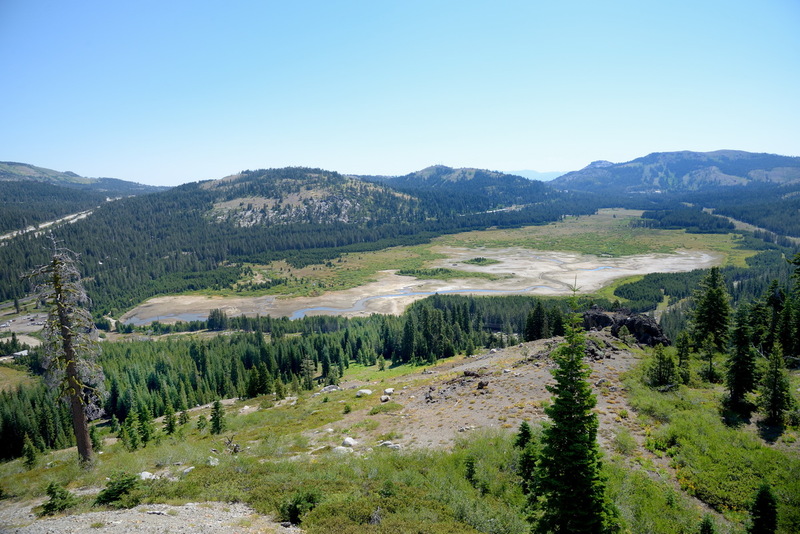 We will wager that you probably haven’t been receiving any invitations lately from the Truckee Donner Land Trust to visit the Donner Summit Valley and Van Norden Meadow. The reason is pretty simple. Who’s going to feel like donating money when they see the havoc that the Land Trust has wrought on the Valley? The Land Trust has put out a lot of propaganda concerning their draining of Van Norden Lake and their fantastical meadow restoration plan. It’s pretty easy to make brochures and give slide shows about these topics but it turns out the reality is pretty shocking. It’s no wonder that the Land Trust would have everyone switch their focus away from the habitat destruction to a more scenic area like Carpenter Valley. You won’t see any “docent tours” of Summit Valley for the next few years. 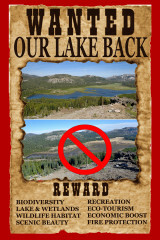 At the writing of this post we are in the first week of August up at Donner Summit. This is the start of crunch time at the summit. All the snow melt has drained out of the Valley and no more surface water is flowing in. The situation is shown in Figure 1. The three main water inputs into the Valley, Lytton Creek, Castle Creek and the South Yuba River have all dried up. The ground water discharging from the surrounding slopes has fallen to below the root level of most of the plants in the meadow as a result of evapotranspiration and the Valley is going dry and will remain dry for the next three months until the rains come in October . This is the normal cycle in the Valley that has gone on for thousands of years. It was only after the first dams were built in the late 1800s that some water remained in the Valley after August. Before there was water storage in the Valley, it became a dried out landscape every summer. 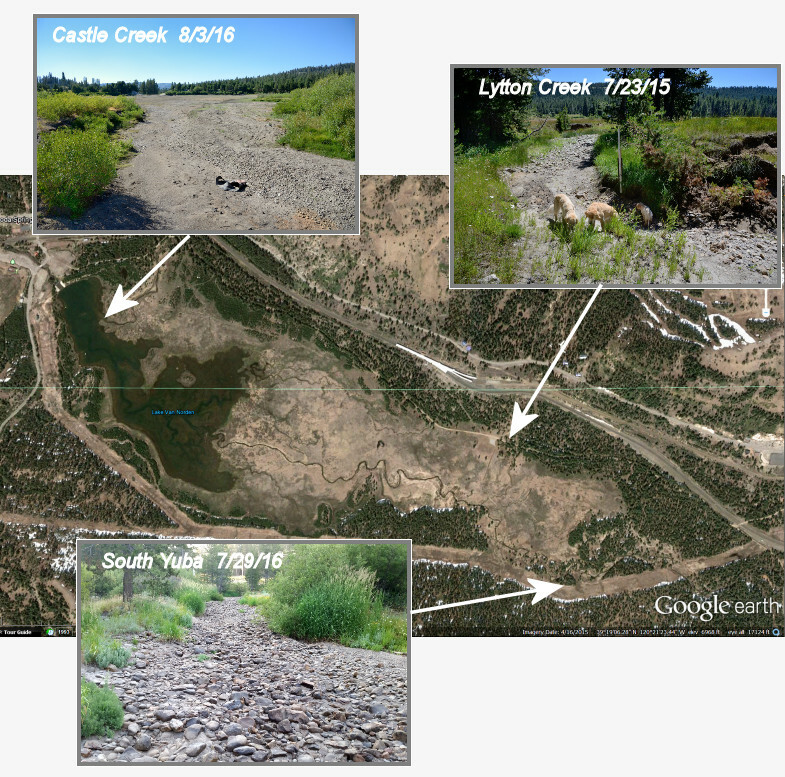 Figure 1 – The three input creeks into the Summit Valley have all gone dry by August 1. We would challenge all those misguided people that believe that somehow “meadow restoration” is going to magically provide more water to the Valley to come up and take a look now. Let’s hear from SYRCL about the wonders of the South Yuba River which is now just a dry creek bed from Van Norden Meadow to Kingvale. How about the Land Trust coming up and showing us where in the dried out lake and creek beds the great fishery they claim will thrive after their plan to drain the Valley. Maybe Tom Applebaum can show us his secret fishing spot on dried out Castle Creek. And probably most ludicrous of all, perhaps Anne Chadwick can lead a hike out into the dry meadow and explain to us where all that water she was planning on adding to the Valley is going to come from, especially considering it was on her watch that almost six and a half MILLION gallons of stored water was drained from the Valley. And we would challenge everyone to come out into the Valley in the next couple of weeks and see just what we have been talking about for the last four years. As we absorb the shock of seeing the arid lakebed and dried out meadow, keep in mind that IF the Land Trust does lower the spillway five feet, the water situation in the Valley will be much worse. As bad as this year is, remember that we still had a lake out there until the beginning of July that maintained the water table and allowed the vegetation to flourish. If the spillway is lowered five ft in the future there will be no lake at all in the Valley and the water table will drop five ft. Instead of the the Valley going dry in August, it will probably be dry by the end of June. With a lowered water table, vegetation such as the Lemon Willow will wither and die. No water fowl, no migratory birds, no fish, and no Osprey, Eagles or Pelicans. 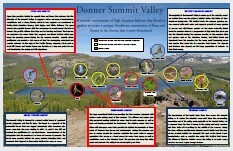 There are many people that believe that prior to the coming of the pioneers, the Donner Summit Valley was a green lush meadow during the summer. Unfortunately that was only true in early summer. Unimpeded, the South Yuba River drained the Valley every summer and for most of the summer it was a dry meadow. It is only in the last century the Donner Summit Valley has been a lush, green Valley alive with wildlife and wetland vegetation. What people forget it that it is due to the storage of some of the snow melt water in the valley by Van Norden Dam that the Valley thrived. If you don’t believe that, please feel free to come up and take a walk in the meadow in the next month or two and see what the Valley looks like without water. Take this Google Earth flyover of the dry Valley. Thank you George, you have done a superb job documenting your case study on the mismanagement of this beautiful valley. Fortunately this year we had a normal snowpack on the summit, if not, TDLT would be blaming the lack of water in the dry creeks on the drought. It will be interesting to see what kind of pretzel logic; TDLT will try to use to spin this obvious catastrophe. TDLT has now tested their beautiful hypothesis and the dry arid valley is an ugly fact.